Should the Stripe API keys be read from the project properties or do you want to specify explicit values for the secret publishable keys. The secret key is only stored server side and is never exposed to the client. This action is for test app use only, use it to specify your test secret key. 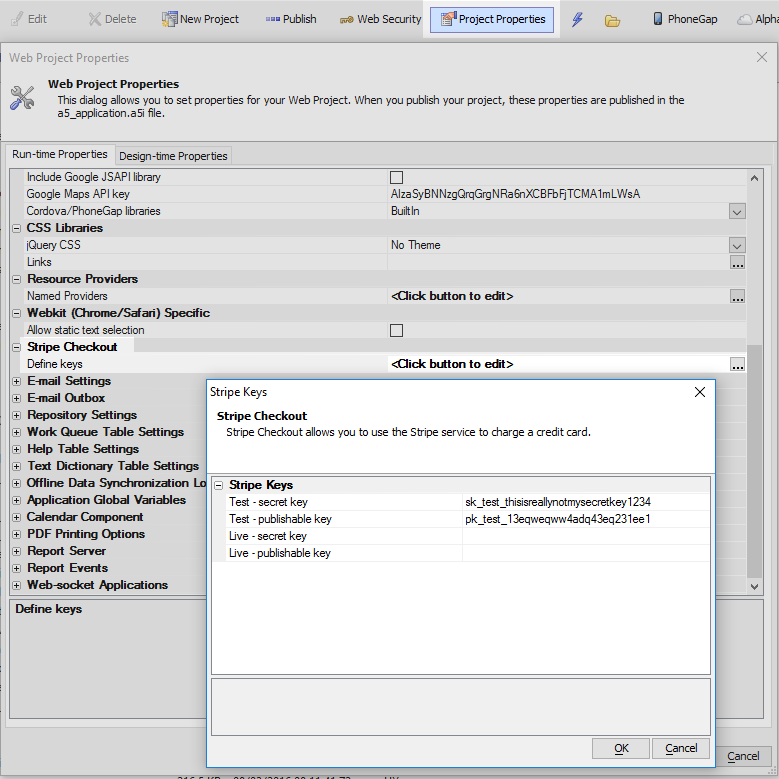 For test app use only, specify you test publishable key. For live app use only, specify your live secret key. For live app use only, specify your live publishable key. Set to test for app testing. Use the Stripe supplied credit card numbers for testing. No money is transferred. Set to live when ready to start charging credit cards with your app. 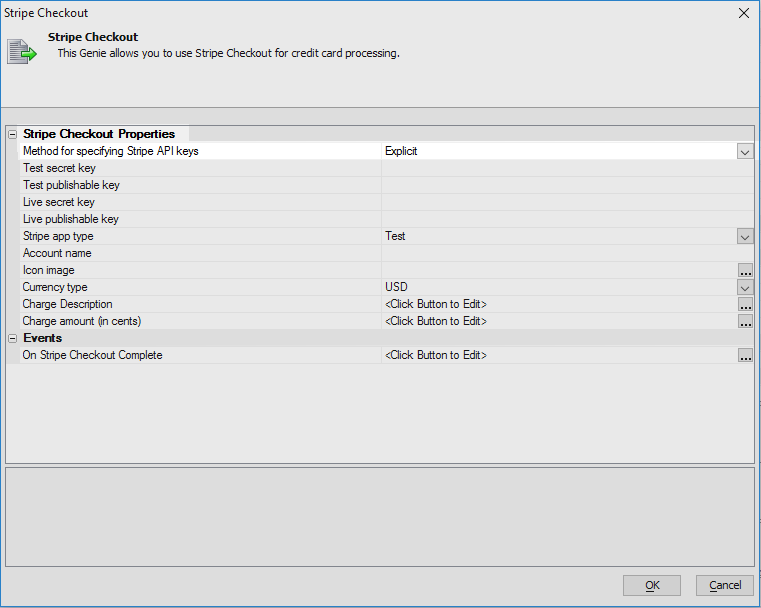 Enter the account name as it should appear within the Stripe Checkout popup. 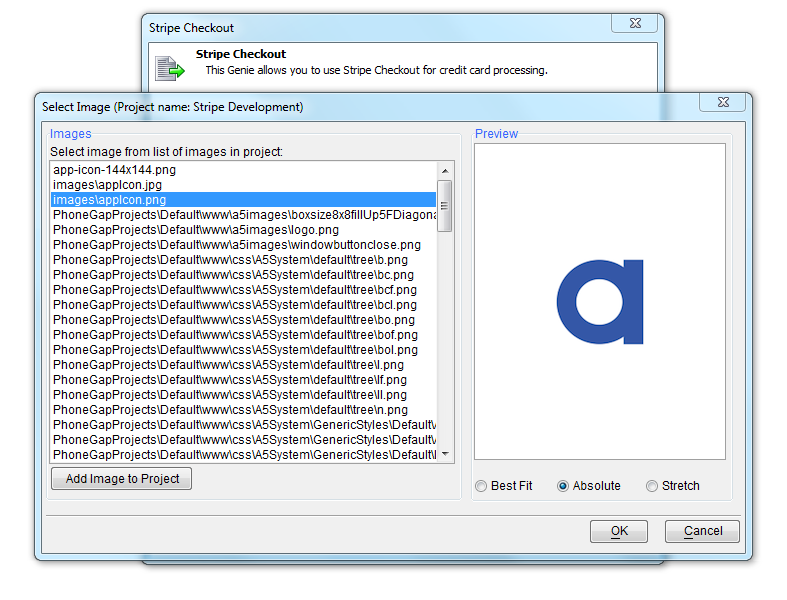 Specify the image for use as the app icon within the Stripe Checkout popup. The image must be 128px by 128px. Enter the country currency code. Stripe Checkout, and the Stripe API, allow you to process credit card payments from within your desktop web or mobile app. You will need to obtain your unique test and live authentication/api keys from Stripe prior to working with Stripe Checkout within your app. See the Stripe Website to setup your account. A typical use case is to assign the action to a button click event, once the total of all items to be purchased has been computed. The Stripe API allows you to use the popular Stripe service to process credit card transactions. Entering the Stripe Checkout Keys in the Project Properties allows you to easily use Stripe Checkout within multiple components. Be careful to enter the test keys (typically prefixed with sk_test and pk_test) and the live keys (typically prefixed with sk_live and pk_live) in the appropriate fields. The secret key is used server side when the server is communicating to the Stripe API with the token supplied by Stripe Checkout. The secret key is never revealed client side. The app type can be Test or Live. Use Test for all of your testing and when you are ready to go live you must switch this property to Live and republish the app. If you are building a PhoneGap app, make sure to rebuild the PhoneGap app and upload to PhoneGap Build. The icon image is displayed at the top of the Stripe Checkout component. The recommended minimum size is 128 x 128 px. Supported image types include .gif, .jpeg and .png. 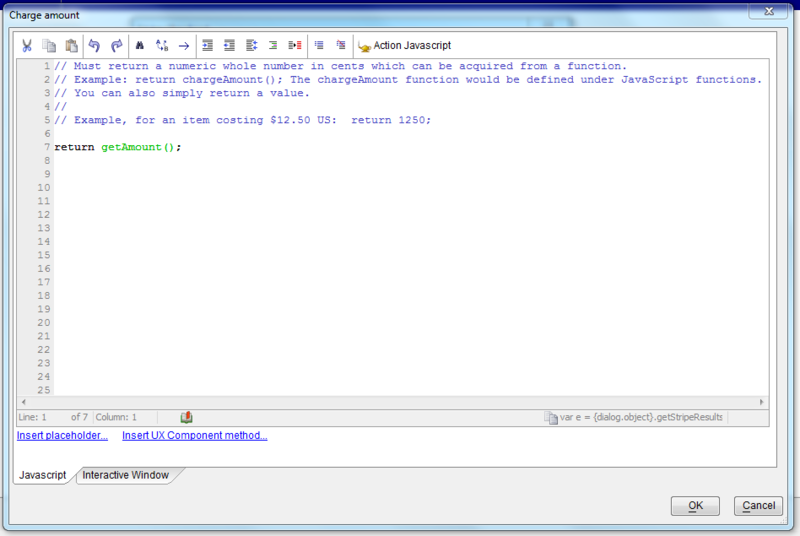 This specifies the currency of the amount being charged. The code entered here is the 3 letter ISO country code. 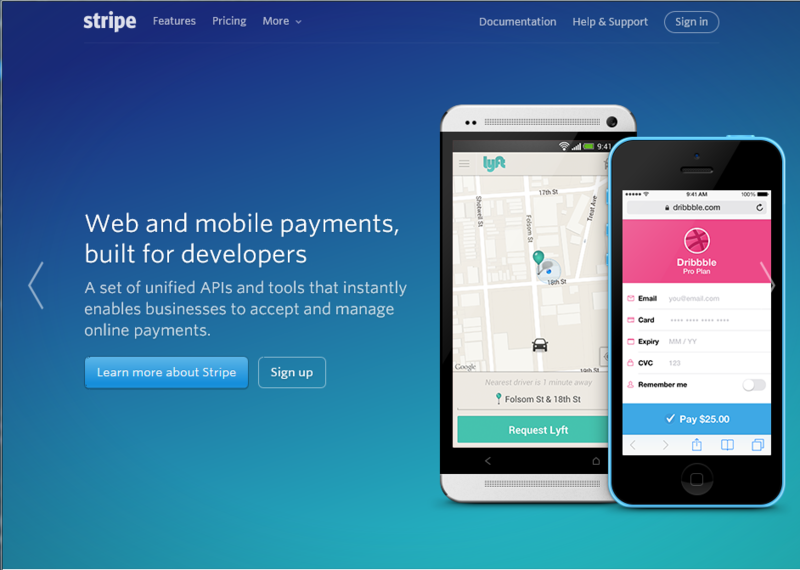 Stripe offers support for a worldwide range of currencies. You can accept payments in your supported currencies from almost any credit card and debit card no matter where the customer lives. Customers in other countries may be charged additional fees by their bank. See Stripe Charges Doc for more information. All submissions of payment info using Stripe Checkout are made via a secure HTTPS connection. However, in order to protect yourself from certain forms of man-in-the-middle attacks, it is suggested that you serve the page containing the payment form with HTTPS as well.